Therma-Kool Reusable Hot/Cold Therapy packs are the preferred choice of school nurses and athletic trainers.Used everyday in clinics,hospitals,and doctor's offices to relieve arthritis and joint pain,muscle strains and stiffness. Therma-Kool is a reusable gel pack designed to provide comfortable pain relief when cold or hot therapy is required. Easy to Use: Freeze for Cold Therapy, Microwave for Hot Therapy. The different styles and sizes makes application easy. Effective hot/cold therapy is a proven pain reliever. Used everyday in clinics, hospitals, and doctor's offices to relieve arthritis and joint pain, muscle strains and stiffness. Can be washed easily and remains odor and bacteria free. Remains soft and flexible when frozen! Contours readily to all parts of the body. Safe for Children with Adult Supervision. Hospital Proven / Recommended by Doctors. Great Replacement for Ice Bags and Hot Water Bottles. Made of USP Food Grade ingredients. Therma-Kool Reusable Hot/Cold Therapy packs are the preferred choice of school nurses and athletic trainers.Used everyday in clinics,hospitals,and doctor's offices to relieve arthritis and joint pain,muscle strains and stiffness. 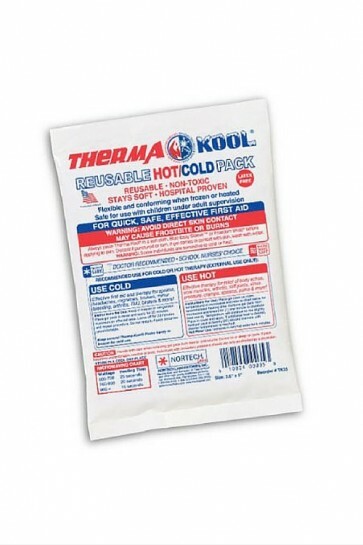 Therma-Kool is a reusable gel pack designed to provide comfortable pain relief when cold or hot therapy is required.Use cold for the treatment of sprains, strains, headaches, contusions, bruises, minor bleeding/burns. Use hot for temporary relief of muscle stiffness, aches and pains. Therma-Kool is the original hot / cold therapy gel . For cold use store in refrigerator or freezer.For hot use place in microwave for up to 35 seconds (see gel pack for specific instructions).